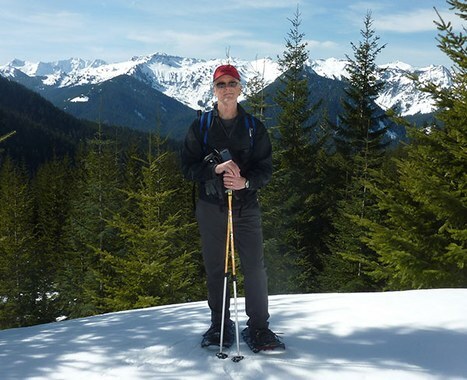 Mike Kretzler, a member of the Olympia Branch since 1998, describes himself as a hiker and backpacker who recently took up snowshoeing again. He's a trip leader for these activities, and many recognize him as the course chair for our branch's Navigation program. These days many Olympia Mountaineers know Mike Kretzler as a trip leader for hiking, backpacking, and snowshoeing and a course chair for the Navigation program. What they might not realize is Mike's has a long leadership history with the chapter, including a term as Secretary and a term as Council Chair. He currently writes the Olympia "branchingout" section in the quarterly Mountaineer magazine and will begin serving as web content manager for the Olympia Branch pages on Mountaineers.org. He has been recognized as a Super Volunteer since the program originated in 2016. Mike not only serves as the course chair for Navigation. He also spearheaded the committee that launched the course in Olympia. The first navigation training he led was teaching map and compass in the Wilderness Skills course. He realized there was a need for a more comprehensive Navigation course that would include both course and field work. He took the Navigation course in Tacoma and used this to determine what Olympia needed. The committee, which included Tom Eckhout, Bob Keranen, and Todd Mooney developed the topics and lectures, built the outdoor exercises, and recruited volunteers to launch the first class in August of 2011. 14 students graduated that first year. 57 students graduated in 2017. Mike took over the "branchingout" magazine section when The Mountaineers switched from a monthly printed Go-Guide to listing courses and activities online. His contribution to Mountaineer magazine is limited to 300 words, but since he changes content with each magazine and is good about getting the material in on time, he is often granted a few extra words. His interest in the outdoors began when he belonged to a scout troop. He still goes on trips with friends he made in this troop. He recently retired, and while he enjoys the extra time to play outdoors, he's also staying busy as he accumulates more responsibilities. He enjoys both adventure and tourist travel. He and his wife spent time in China last October. He has backpacked in Idaho, Wyoming, the Alps, and Corsica, and he participated in a Mountaineers Global Adventure tour to Patagonia. He commented about his passion for teaching and leading trips: "They are related, as many of the trips are for beginners. I like helping people get comfortable."